Known as the "Coca-Cola" route, Marangu approaches Kilimanjaro from the southeast. It is the oldest, most well established route. 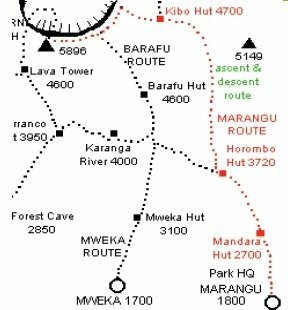 Many favor Marangu because it is considered to be the easiest route on the mountain, given its gradual slope and direct path. The minimum days required for this route is five, although the probability of successfully reaching the top in that time period is quite low. Spending an extra acclimatization day on the mountain is highly recommended. 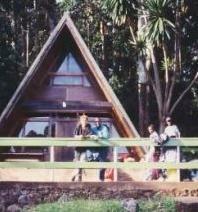 Marangu is the only route which offers sleeping huts in dormitory style accomodations. There are 60 bunk beds each at Mandara and Kibo Huts, and 120 bunk beds at Horombo Hut (because only Horombo Hut is used on descent). Guests are supplied with mattresses and pillows, but sleeping bags are still required. The huts have communal dining halls and basic washrooms, ranging from flushing toilets and running water at the lower huts to long drop toilets and buckets of water at Kibo Hut. Also available for consumption are soft drinks, bottled water, and beer. We will meet you at the Kilimanjaro International Airport and transport you to Moshi, directly to the Hotel, where you will spend the night. The following morning, our mountain crew will check your gear, prepare you for the climb, and answer any questions you have. You may leave a bag behind at the hotel in a secure office until your return. Walking time: 5 hrs. ; elevation change: +740 m.
At 8:45 a.m. our representative will take you from your hotel to Marangu Gate (55 km./43 mi.) where your permit for trekking will be issued. The permit process will take approximately one hour and then you will start trekking. The route begins at the National Park Marangu Gate and then travels through the natural rain forest where you likely will see Colobus monkeys. You then will arrive at the first hut, called Mandara, where you will spend the night. Walking time: 5-7 hours; elevation change: +1,000 m.
After breakfast at the dinning hut, your chief guide will walk you through the border of the forest where you again may see white and black Colubus monkeys in the large trees. You also may enjoy the flora and views of Mawenzi and Kibo peaks. A packed lunch will be served for you at the halfway point to Horombo Hut. Finally, dinner and overnight will be taken at Horombo Hut. Side trip: Horombo Hut to Zebra Rock (4,000 m./ hr.) then to Mawenzi Hut (4,600 m./2 hrs. ); elevation change: +880 m.
Walking time: 5-6 hrs./6-7 hrs. ; elevation change: +980 m./+1,195 m.
Estimated distance: 9 km./9 km. After breakfast you will start your journey to Kibo Hut, passing the semi-desert landscape of the Saddle. You will take lunch in the Saddle. You also will see the last water area and then continue to Kibo Hut, where you will rest and prepare for your trek to the summit. 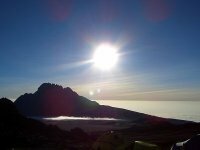 At 11 p.m. to midnight, you will leave most of your belongings at Kibo Hut and begin your climb to the summit, where you will have a spectacular view of the sunrise and the Mawenzi Peak. You will pass Gillman’s Point (5,685 m.) and Stella Point (5,700 m.) on your way to Uhuru Peak (5,895 m.), the highest point in Africa. Walking time: 3-4 hrs. ; elevation change: -980 m.
After reaching the summit, you immediately will return to Kibo Hut. There, you will take a meal and a short rest. You then will pack all your belongings and continue your descent down to Horombo Hut, for approximately three hours. You will take dinner and spend the night at Horombo Hut. Walking time: 6-7 hrs. ; elevation change: -1,920 m.
After breakfast you will go down to Mandara Hut for lunch and then continue to the Marangu Gate where you will meet our representative who will drive you to the Zebra Hotel. A Five-Day Marangu Route Itinerary also is available, but you will have no acclimatization day.